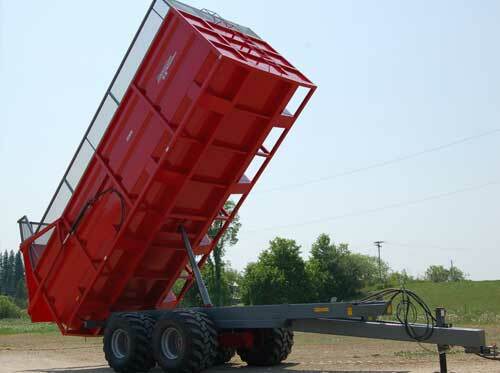 Our NX Series dump trailers are serious, feature-loaded and heavy-duty dumpers. Carefully developed and confidently presented, the NX models are meeting the needs of many crop farmers and other heavy users. For more information, please contact us. 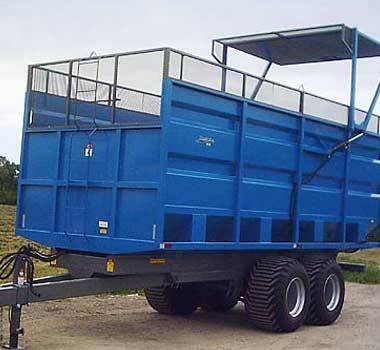 And keep in mind that we can customize to give you the ultimate trailer for your needs. 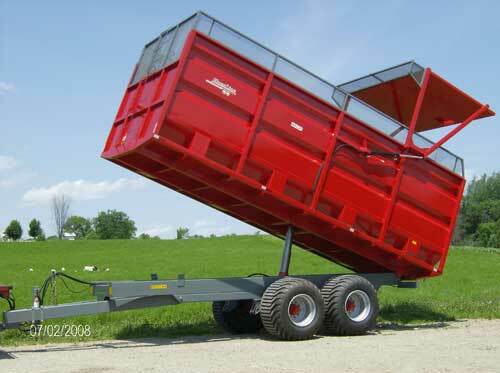 NX Series dump trailers dump at a steep 55° angle. 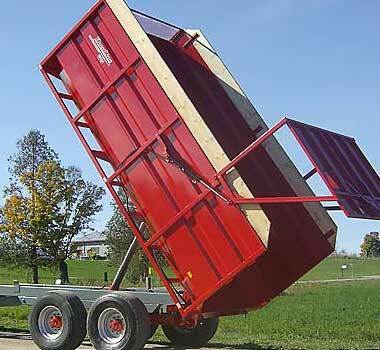 When dumping, the angled side corners and the high- clearance hydraulic gate ensure clean and easy unloading. Lights and signals are standard on all NX Series trailers. Reverse lights are standard on NX200 and NX220. 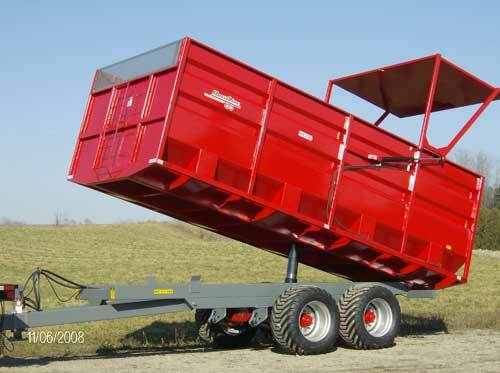 All dump trailers are available with custom colors of your choice. 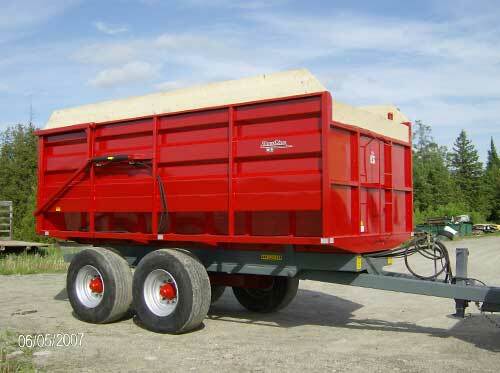 See the custom trailer slideshow for more examples. Spring suspension axles are optional on all NX trailers, particularly the NX200 and NX220. 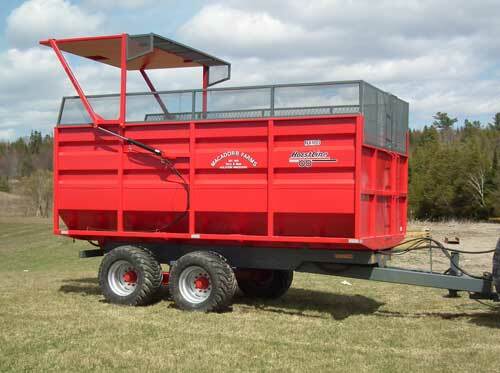 Our suspension is a standard "hutch", 25,000lb per-axle tandem kit. The axles are 5 x 5 x ½ steel tube beams, 4" dia. spindles and 10-bolt,16,000lb. ag hubs. Track width is customized for each tire size to match the trailer width. Suspension axles offer a much smoother ride than walking tandems at higher speeds and minimize the stress on the trailer and towing tractor with only a slight compromise in dumping stability. NX series trailers come with a height-adjustable, rubber-suspension drawbar with a swivel clevis and heavy-duty 12,000lb. drop leg jack. 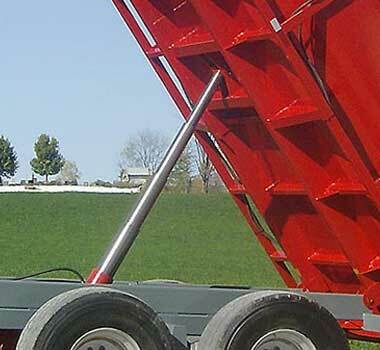 Center-mount telescopic hoists dump steeper, faster and with less oil. 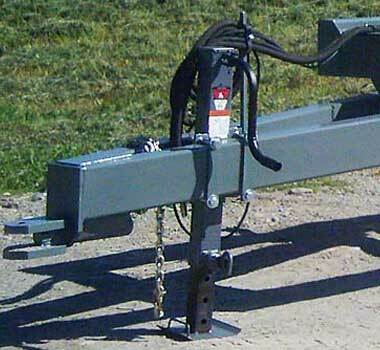 The box lowers much quicker than other types of telescopic hoists and minimizes stress on the trailer frame when dumping. 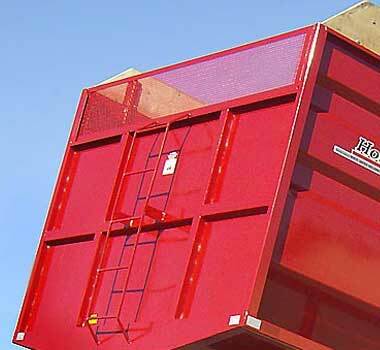 Horstline boxes are specially designed to handle the force of a mid mount hoist. 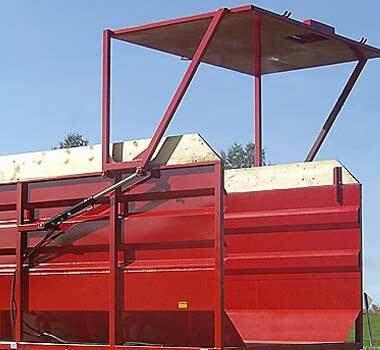 The hydraulic gate offers excellent operator control and dumping clearance. Other advantages include the superior gate seal, the elimination of any locking system and the fact that the gate can be opened without dumping. All Horstline boxes have angled corners between the floor and side, greatly increasing the strength of the sides and preventing the load from getting stuck in the box when dumping. 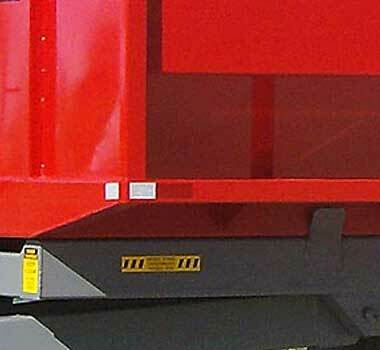 The mesh panel front greatly increases visibility when loading the trailer.